Banff has always attracted creative people, from landscape artists and photographers to the talents of tomorrow who hone their craft at the Banff Centre. 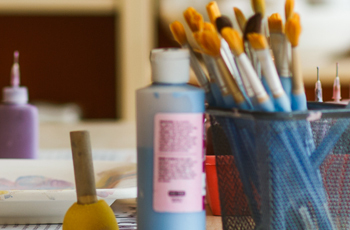 In the heart of our community, the Bison Courtyard businesses are hosting some fun, artistic activities for anyone who feels like flexing their creative muscles. On Thursday, January 25th, Crock A Doodle is hosting a special Snow Queen Ladies Paint Night, as part of Banff’s SnowDays celebrations. Draw some inspiration from the fabulous snow sculptures on Bear Street and create a special pottery piece of your own. It’s a great opportunity to get your girls together and enjoy a glass of wine while you paint. 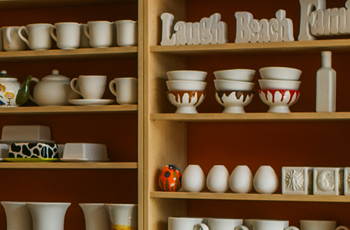 The event runs from 7 – 9 PM and prices depend on the piece of pottery you choose to decorate. Find out more and reserve your spot here. Tag @crockadoodlebanff and @bisoncourtyard on Instagram to share your creations with us! Just across the courtyard, Rocky Mountain Yoga has teamed up with the Wild Flour Bakery to host monthly ‘Create to Meditate’ paint nights. The practice of painting can be another route to mindfulness and these fun, creative evenings will help you find your flow. No painting experience is necessary – Mindy will be there to guide you through the whole process! The first class of the year was a huge success; if you’d like to take part, you can find future dates and more information here. However you choose to create, have fun!